A simple gift that makes a powerful statement! The original Loving Family® pendant is the gift that moms of all ages love to receive year after year. 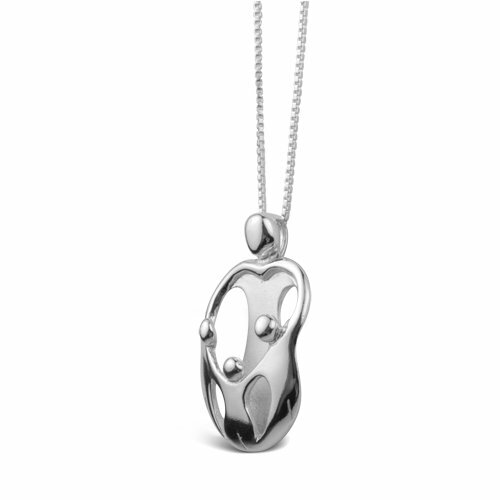 Measuring 1" L x 1/2" W, the pendant depicts a loving mother and three children whose touching embrace forms a heart. Striking pendant comes ready to wear on an 18" sterling silver box chain with spring ring clasp. This delicate, artistic symbol of family love is sure to warm the heart of any mother - no matter the age of her children. Proudly made in New Mexico, USA with fair labor. We do our part for the environment by crafting our jewelry from recycled genuine sterling silver. I got this for Christmas this year. I have three daughters and I think the necklace really captures a mother's love of her children. My youngest has already decided which one is her! It's really pretty and I love it. I was skeptical at first, but when the pendant arrived it was very nice. It is very lovely, and does not have any sort of "cheap" feel to it. It is petite and sleek; doesn't stand out too bad, but is pretty enough to catch attention! A longer chain is needed when ordering, just so future buyers are aware. But, this was an excellent purchase. LOVE, LOVE, L-O-V-E this necklace... just gorgeous and so special to wear. Others notice it when I wear it and make wonderful comments on it. The sterling silver was my main attractor... I wanted something beautiful and yet "simple" enough to enjoy wearing with casual or dressy outfits. This works for both. Great price and an excellent gift to give to new moms, grandmothers, mothers at any point in their motherhood basically... and to buy for yourself! Good quality, beautiful and strong enough chain to feel confident it won't break anytime soon.